Which Jomtien Accommodation Should You Stay at? Soi 5 in Jomtien is an undervalued road in Pattaya. Talk about saving time and not having to wake up early when you go there! 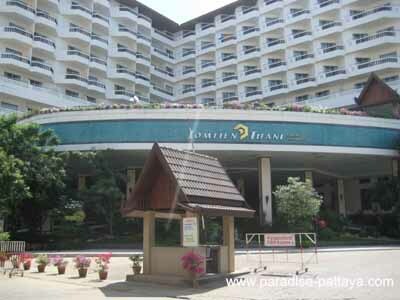 It also is home of the popular Jomtien Thani Hotel which you find below. 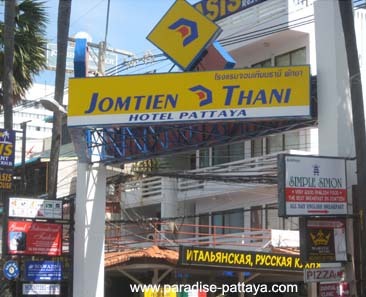 Jomtien is the preferred location in Pattaya for many tourists and expats. Here you don't have the hustle and bustle you find in many areas in the city. The beach is not as crowded and cleaner and still you have all that Pattaya has to offer. It is easy to hop on a Baht bus and take a 10 minutes ride to Pattaya for 10 baht. View my Pattaya Jomtien picture gallery here. 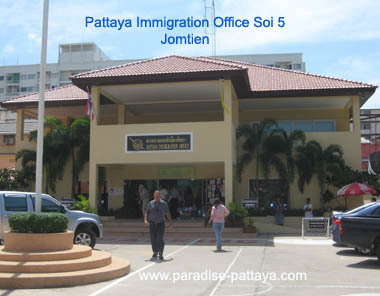 Soi 5 is where the Jomtien Thani Hotel Pattaya is located you also find the Pattaya Immigration Office and the Post Office. Agoda.com will not only search for Jomtien Accommodation but search all hotels available in Pattaya, Naklua and Jomtien. It will search 30 Web Sites and return with over 180 Hotel listings. 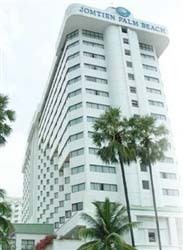 Room rates start at 400 Baht to 5 star hotels in Pattaya, Jomtien and Naklua. This is the largest and best hotel search engine. If you can not find your hotel here you won't be able to find it online. You can look at each hotel listing and find hotel details, hotel reviews, photos, rates and maps. Have a safe trip to Pattaya, Thailand. Looking for a condo instead? In that case feel free to check out Expat Condos. Depending on what you're looking for you can do a virtual tour of the Jomtien condo. Choose from the different condos before even arriving and book a place once you arrive. In any case - have a fun time in Thailand!